Hanukkah is behind us but the holiday season is still with us. The lights are up all around town with plenty of blue and white lights, too, to brighten many Houston neighborhoods. Before the holiday season passes us by completely, and before you buy the last gifts for your children or another loved one, I want to recommend two more gifts to add to your list. Cantor Mutlu recorded on CD “A Year of Music at Beth Israel”. 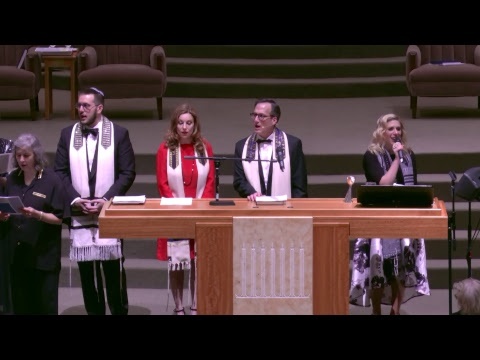 Much more than a review of synagogue music, it’s a reflection of soul-touching musical moments that stir the heart and soul. Naturally, I’ve had the privilege to hear Daniel’s music in the sanctuary and chapel. I’ve also had the extraordinary pleasure to stand next to him at the Holy Ark when he intoned Avinu Malkeinu. Most recently, I listened to him on CD during a recent trip home from New York City. On your iPhone, in your living room or car, Cantor’s music can open pathways to spiritual moments of your own. His CD is a magnificent gift to yourself or others. And, if you like it as much or more than I did, you come any Shabbat or holiday when Cantor Mutlu is live and personal. Rabbi Sam Karff’s memoir was recently published. “For This You Were Created: Memoir of an American Rabbi” is Rabbi Karff’s fourth book and also his most personal. In it he describes more than a chronology of his life; he writes thoughtfully about how his life unfolded in the context of a world which he helped shape around him and for us. Unique in his generation, Sam served in leadership roles in Houston and beyond where Jewish and secular life intersected, requiring a person of his intellect and compassion to identify its meaning. Sam also contributed to the future of medical school education at UT Health by introducing a permanent part of their curriculum that focuses on the doctor’s role in spirituality and health. Finally, Sam explained the profound place his wife, Joan, and his family have held in his life and the times they’ve shared. If ever you’ve wanted to glean more from the life of deeds unique to Rabbi Karff’s years, this is it. Every household should read and share this book. I would be remiss if I didn’t mention my own book, “God of Me: Imagining God throughout Your Lifetime”. This book is especially for those who a desire a new way to imagine God. It’s accessible and meaningful for teenagers and above to begin the journey again. It’s available on Amazon, at JewishLights.com, and in the Temple Gift Shop. Cantor’s CD and Rabbi Karff’s book are available on Amazon, iTunes, and in the Beth Israel Gift Shop. During the darkest season of the year, we aim to increase light and holiness. Chanukah is dedicated to these themes as is the spirit of every December holiday. Let these gifts be part of your life to warm your heart and touch your soul.